Hello to all! This week we will be on site working on Courtney's future home! What: This weekend we will be sheathing our roof, installing blue foam around the exterior of the house, and installing basement windows. As we move into the first full week of summer, and wind-down the 2018 Women Build event, I want to thank every person reading this for being part of our Habitat community. Our volunteers (you know who you are!) have done a tremendous job at the house on Housatonic Street in Dalton, preparing for the Berkshire Bank Xtraordinary wall panel build, and now moving into Neighborhood Revitalization work on Pittsfield's Westside. Through their efforts, we are growing our capacity to help people find safe, stable and affordable housing. 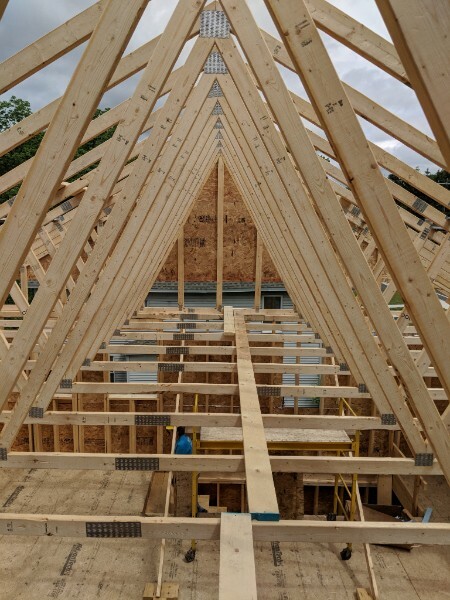 When we began work on the house in Dalton, it was still snowing on us from time to time, but now the warm sun is out, and the positive change in the weather has been as striking as the progress at the build site. I want to thank everyone who has donated their time, energy, and resources to Central Berkshire Habitat for Humanity. The construction program relies on volunteer power and we would love to have all of you back on site with us soon. Have a great summer! Habitat will occasionally host outside volunteer groups and we ask that if you are interested in volunteering, you contact our volunteer coordinator Katiana Selens (kselens@berkshirehabitat.org) or our volunteer engagement coordinator Aliza Mendelowitz (amendelowitz@berkshirehabitat.org) to notify us of your desired build day. This will help us to accurately plan for the expected number of tasks and leaders necessary for the day. We greatly appreciate your flexibility as the days shift and change. Thank you! As many of you know, we have historically held build days on Fridays 8am-noon and Saturdays 8am-3pm. We will now be hosting full build days on Fridays and Saturdays from 8am-3pm on both days. We look forward to having you on site with us! "Last week in Dalton a fantastic collection of Women Builders and regular volunteers helped groups from Soldier On and Sacred Heart Church continue building Courtney's house. 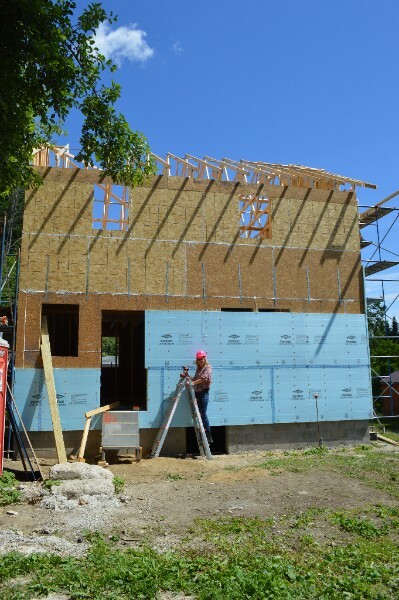 We were able to accomplish the following tasks: finished sheathing the gable end walls, installed more blue insulation, fastened hurricane ties to trusses, and a group of skilled volunteers prepared walls for heating duct installation. Now that we are working on the second story and on the roof, scaffolding has become essential. Thanks to everyone who was on site last week!" "Next America's Top Model runway...?" "2/3 of U.S. steel production comes from salvaged steel"